As of January 2018, our volunteers have distributed more than 12,000 brand new books to at-risk readers. We’ve written more than 200 articles on ways to make literacy an “every-day” part of family life. Our volunteers have curated hundreds more articles with literacy tips and help for supporting young readers. the single most important determinant for becoming a successful reader is the amount of reading material at home. Our family is fortunate. We have books at home, and we have an amazing library system. For us, having reading material (books, magazines, newspapers) is the norm, not a luxury. But that is not the case for all families. So those books authors and publishers send us go readers in need: kids who struggle with meeting reading benchmarks or who have no books of their own. We also send books to teacher’s in Title I schools building their classroom libraries. Donations fund this work, and 100% of the money we receive goes to providing literacy information and shipping books. 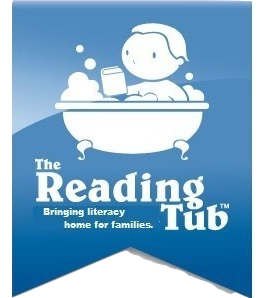 The Reading Tub mantra is to bring Literacy home for families. That’s Literacy with a capital L and includes reading, writing, critical thinking, and communication. Sounds like a lot and maybe even complicated. It doesn’t have to be, and everything we do is driven by the idea that we CAN make make it easier for families, caregivers, and readers too. Our goal is the same as the larger organizations you know well: we want to ensure that every child is a strong, successful reader. In the last five years, decreases in donations and volunteers have caused us to change our operational model. Nearly all of our volunteers have returned to work or taken a second job. We suspended the Use Your ABCs project, which engages struggling readers with reading and publishing their own book reviews. Volunteer reviewers are using their libraries (a good thing), but that is decreasing exposure to lesser-known but equally amazing books for children and young adults. We are always seeking volunteers, and I hope you consider The Reading Tub. Just send me an email. Donate. We are 100% volunteer, but shipping books and maintaining a website have costs. Share this website with family and friends. Tell them why you love and use it. Connect with us on Facebook, Twitter, and Pinterest then share the items that have meaning for you. Subscribe to our newsletter the Wash Rag to keep up to date with what’s happening. I promise, we won’t fill your Inbox with stuff.